Paul McCallum's retirement Monday marks both the end of an incredible football career and the end of a remarkable era in world football. After spending last season with the Saskatchewan Roughriders, famed kicker McCallum was released in December, and he decided to sign a one-day contract to retire with his hometown B.C. Lions (where he found the most CFL success). McCallum's retirement deserves a ton of attention both for his astounding individual accomplishments during his 23-year CFL career and for the wide variety of fascinating teams, leagues and eras he experienced. Let's start with McCallum's records and statistics. He kicked 717 field goals over the course of his career, second in CFL history only to Lions' legend Lui Passagia (who was B.C. 's primary kicker when McCallum first joined the team in 1993), and notched 3,131 points, also the second-best in league history. He set a record for consecutive field goals made (30) in 2011, and also posted the best single-season field-goal percentage in CFL history (94.34 per cent) that year; both records were broken by Calgary's Rene Paredes in 2013, but it's notable that Paredes' consecutive streak carries an asterisk in the minds of some thanks to the league not counting blocked FGs as missed ones. McCallum's 2011 season was maybe the best football season by a kicker ever, and especially impressive considering that he also did a solid job of punting that year; there are other seasons in contention, but few where someone's done so well while holding down both jobs. McCallum also holds the record for the longest field goal in CFL history, a 62-yarder in 2001, and he's seventh all-time in CFL career accuracy with an 80.38 per cent mark. He was great in the playoffs, especially for B.C., where he made all 36 of his field goal attempts over nine seasons. He was still reasonably effective last year, too, making 29 of 36 field goal attempts (80.6 per cent) for the Roughriders. 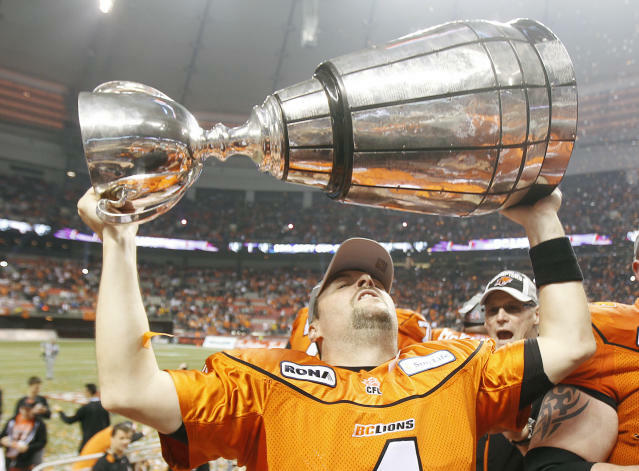 All in all, McCallum won two Grey Cups (in 2006 and 2011, both with B.C. ), a Grey Cup Most Outstanding Canadian award (in 2006, where he made a Grey Cup record-tying six field goals on just six attempts), a Most Outstanding Special Teams Player Award (in 2011), and was selected to six divisional all-star teams (including one in 2014), and was twice picked as a CFL all-star (in 2010 and 2011). That's an incredible career, and one of the best ever. It's also remarkable just how much McCallum saw during his career. He started high-level football in the junior ranks with the Surrey Rams (now the Langley Rams) of the CJFL, then went to play an entirely different kind of football, playing professional soccer in the third division in Scotland. He came to the CFL in 1993, first with the Hamilton Tiger-Cats, but couldn't really catch on with anyone, briefly appearing with them, the Lions and the Ottawa Rough Riders that year, then with the Lions again in 1994, then with the Saskatchewan Roughriders (so yes, he played for the Rough Riders and Roughriders in consecutive seasons, and he was the only man to play for or against the Ottawa Rough Riders, Ottawa Renegades and Ottawa Redblacks) from 1994 to 1995. In the spring of 1996, he headed back to Scotland, but to play American football this time, with the Scottish Claymores of the World League of American Football (a revived, all-Europe version of the 1991-1992 league, which was later rebranded as NFL Europe in 1998). He came back to the CFL with Saskatchewan later that year and stayed with the Roughriders through 2005, albeit with a brief and highly entertaining detour: to the XFL. The XFL, or Xtreme Football League, was founded by World Wrestling Federation (now World Wrestling Entertainment) chairman Vince McMahon, and for one spectacular season in 2001, it provided a vastly different form of American football. It had plenty of CFL connections, too, as Max Rosenberg recently explored at The Snap. McCallum was the last active football player anywhere who played in the XFL, and while there are still plenty of coaches with connections to it (including Toronto GM Jim Barker and Toronto HC Scott Milanovich), his retirement really closes the door on that league in one way. The kicker was up to his chin strap in crap, literally and figuratively, when he returned home to Regina two years ago and learned vandals had decorated his house with eggs and fertilized his neighbour's driveway with a dump of manure. The landscaping came the night McCallum missed an 18-yard field goal in overtime that allowed the B.C. Lions to beat his Saskatchewan Roughriders 27-25 in Vancouver and advance to the Grey Cup. "I've never faltered in my confidence and ability to kick the ball," McCallum said. "I really don't care what anybody thinks, except my teammates and coaches. If you sit there and listen to everyone's opinion and take it to heart, it's going to drive you crazy. In Saskatchewan, I stopped reading the papers and listening to the news. I just went out every day and did my job. I did it 12 years there, and it's a tough place to kick (due to the weather). I knew that I would be that much better statistically kicking in the dome." It's somewhat understandable that Saskatchewan wanted to move on, given that McCallum was 36 and only had a 75 per cent career success rate at that point, but that move proved to be a huge victory for the Lions. McCallum's accuracy shot up with them (probably partly thanks to that dome, but he still put up way better numbers than almost anyone else to ever kick there, and he was good on the road too), and he was essential to almost a decade of success and two Grey Cup victories. Dave Dickenson called him "as big an offseason acquisition as we've made" in 2006, and he was right; McCallum would go on to be the Most Outstanding Canadian in the Lions' Grey Cup win that season after making a Grey Cup record-tying six field goals in a 25-14 victory. So, B.C. fans can thank the Roughriders (and perhaps even the manure vandals) for not wanting to keep McCallum around; that led to a lot of great success for them, and for McCallum as well. It's appropriate to see him retire as a Lion, and it's a great excuse to reflect on his amazing football career and the incredible different teams and eras he saw. Here's wishing him all the best in whatever's next.